When people find out I’m flying solo, they ask me, “How do you do it?” But the truth is, a lot of single parents travel with their kids, and it’s not hard. I’ve learned to listen to my children, to be flexible, and to always feed them. Those are the three keys to my success as a traveling single parent (if you can call it that) my kids might disagree with my use of the word “success”. There are no recent, reliable surveys on single parents who travel. Pollsters are far more interested in how much money the travelers are going to spend, so they don’t bother to ask. If they did, they’d probably find out that single parents who travel are a lot like all other parents. That should come as a disappointment to my children, who think I am a space alien. 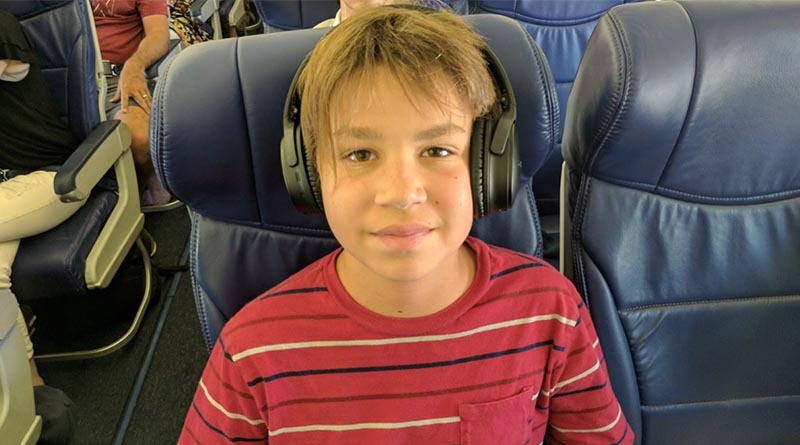 Iden on a Southwest Airlines flight in 2016. As a single parent, you’ll never win when you’re outnumbered on the road. Try corralling three young kids onto a plane if you’re not sure what I mean. You’ll have to get them to buy into the idea of traveling. But before you can share your plan for getting from point A to point B you need to listen to them. What are their concerns? For example, my kids have a particular seating arrangement they prefer: Aren, my oldest son, likes the aisle seat. My daughter, Erysse, will only sit in the window seat, and curiously, she insists on having the shade down the entire flight. This frustrates my middle child, Iden, who refuses to sit in the middle seat. He prefers an aisle seat with someone who isn’t related to him. Iden, Aren and Erysse in Wyoming in 2012. When it’s three versus one, as it is for me, you have to be extremely flexible. When they were younger, the kids behaved like, you know, kids. One wanted one thing, the other wanted something else. Add all of that to the drama of a long car trip, and someone is bound to blow his top eventually. Usually, that was me. So I often turn into Permissive Dad. 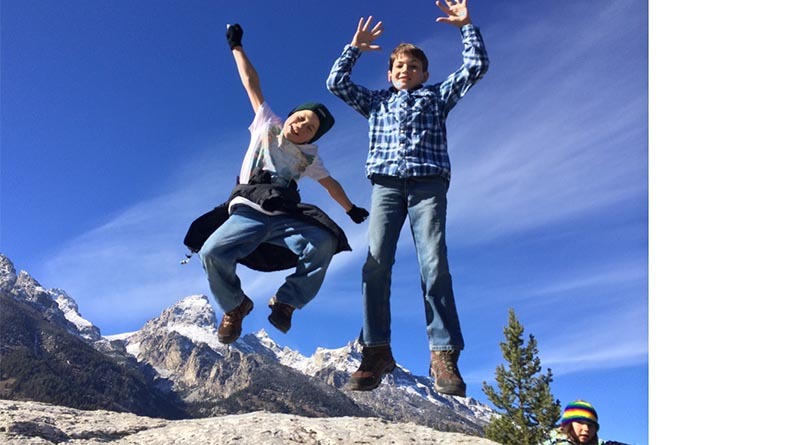 Let the little things slide and make sure my young offspring don’t do something incredibly stupid, like walk off a cliff in Utah or fall down a glacier in Canada. Go on, laugh, but both those disasters almost happened. At the same time, what the kiddos wear or eat on any particular day is less important. As long as we have the right headcount — one, two, three — we are good to go! Erysse and Iden getting their just dessert in Laramie, Wyo. Let’s get real. You can play all the mind games you want, but there’s one thing you can’t do, and that is to forget to feed them. Think of it as a spy movie, where the secret agent vaults over the fence only to be confronted by a pack of angry Rottweilers. Fortunately, he has sedative-laced steaks with which to feed the dogs. Food is kind of like that when you’re traveling with kids. You must feed them. And all the rules about healthy eating seem to go out that same car window through which your daughter wanted to throw her brother. I have a secret to share with you. 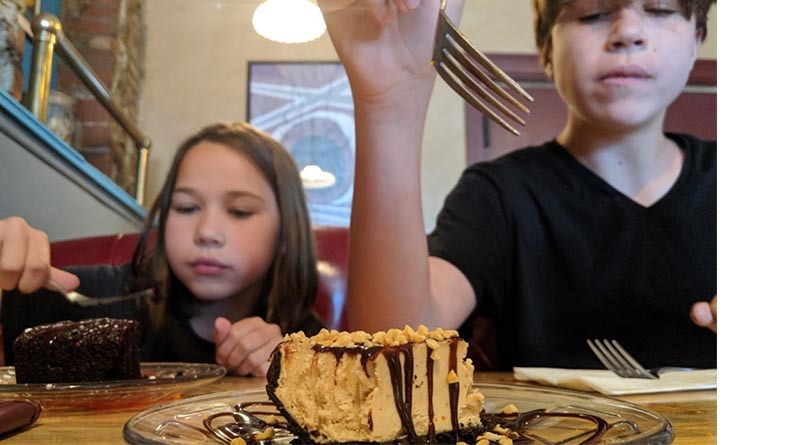 That picture of both of my kids eating pie at a restaurant in Laramie, Wyo., looks like the most irresponsible thing a parent can do. But I took that snapshot at Sweet Melissa’s, a vegetarian restaurant. Both of those pies are actually good for you, made with nut butters and whole ingredients, more or less. Don’t tell the kids. Point is, food is arguably non-negotiable. It is the thing that tips the scales in your favor when you’re outnumbered three to one. No, it’s not as pop-psychology-esque as listening to your kids and being flexible, but it arguably is the key ingredient to a successful single-parent trip. There, I said it. Mostly, single-parent travel is an adventure. I can’t say I love every minute of it, or that my kids love every minute of it, but we like most of it. If you’re thinking of taking your kids out there solo, go for it. What have you got to lose (except your sanity)? Oh, I’m kidding. You’ll be fine.